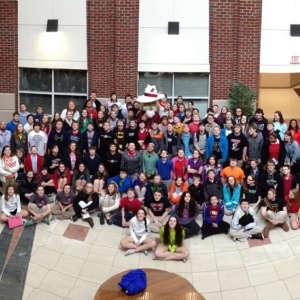 Over 100 Conkwright Middle School students from Clark County and their teachers visited EKU's College of Business and Technology Center on Thurs., Feb. 20, 2014. Hosted by Kentucky Innovation Network Center @ EKU Executive Director Kristel Smith, students joined in on activities simulating their classroom 'Shark Tank' project. The Eastern Kentucky University Business Accelerator and the Center for Economic Development, Entrepreneurship and Technology (CEDET) are seeking innovative ideas from EKU students for a product, service, or charitable activity to enter in the 2014 IDEA STATE U competition.